Last Thursday, May 16th, I drove out to the Washington D.C. area from Peoria, Illinois to present the MegaBrain and our learning center, ELSIE, at the Stroke Month Megabrain Event hosted by Inova Neuroscience Institute held at the Tyson Corner Center Shopping Mall on May 18th. At last count, two thousand shoppers walked through the MegaBrain, visited the events stroke awareness displays, stroke risk assessment counselors and screening tables. Forgive me for being a bad note taker. If you see any name corrections needed in this post, Karen and Joanna have my email address. I will make any corrections immediately. "Inova Neuroscience Institute is a regional leader in the diagnosis, treatment and research of complex neurological conditions involving the brain, spine and nervous system. With eight specialized programs, the Institute is the largest program of its kind in Northern Virginia. Our highly trained and nationally recognized physicians treat a wide range of conditions, including neurotrauma, spine conditions, brain and spinal tumors, memory disorders and stroke and cerebrovascular disease. Our comprehensive research program is committed to the advancement of treatment protocols. Inova Neuroscience Institute employs a multidisciplinary approach so that patients and their families experience expert, coordinated care from diagnosis through rehabilitation." Karen Going and Joanna Fazio were my main contacts there and they helped me set up the MegaBrain Saturday morning and made sure throughout the day that I was doing OK. I appreciated that very much as I do need a lot of that reassurance during those long demo days. Thank you Karen and Joanna! Karen is Cerebrovascular Lead of Neuroscience Administration at Inova Fairfax Hospital in Falls Church, Virginia. Joanna is the Marketing and Public Relations Manager at Inova Fairfax Hospital. Here they are staffing the Inova Services table. Karen is seated on the left and Joanna is seated next to her. Stroke Coordinator Jalil is at the far right. Standing behind Karen is Barb Mancini, Director of the Neuroscience Line at Inova. ELSIE and her MegaBrain were set up in the Fashion Court near Nordstrom, a leading fashion specialty retailer. The Mall also had a Macy's and a Bloomingdale's. To say that the mall is huge is an understatement. Nordstrom alone would probably house our entire Peoria Northwoods Mall. Here you can see the MegaBrain in the background and ELSIE the learning center in the forefront. Ever been inside a brain before? Well, as any good brain surgeon will tell you, "Don't expect nice carpeting like this one has." but you'll get the general feel of it once inside. 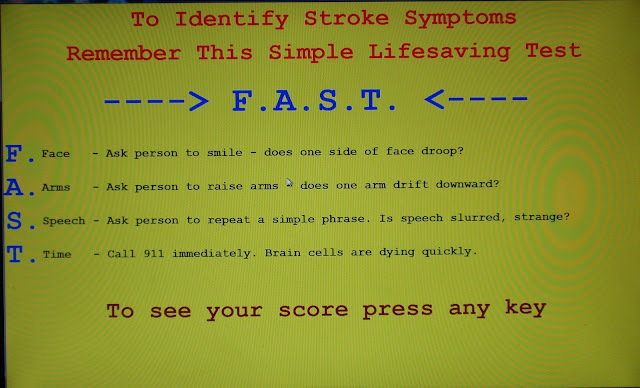 ELSIE, our computer display, has four laptop computers programmed with multiple choice questions about stroke awareness, prevention and detection. The major emphasis is teaching the acronym F.A.S.T. 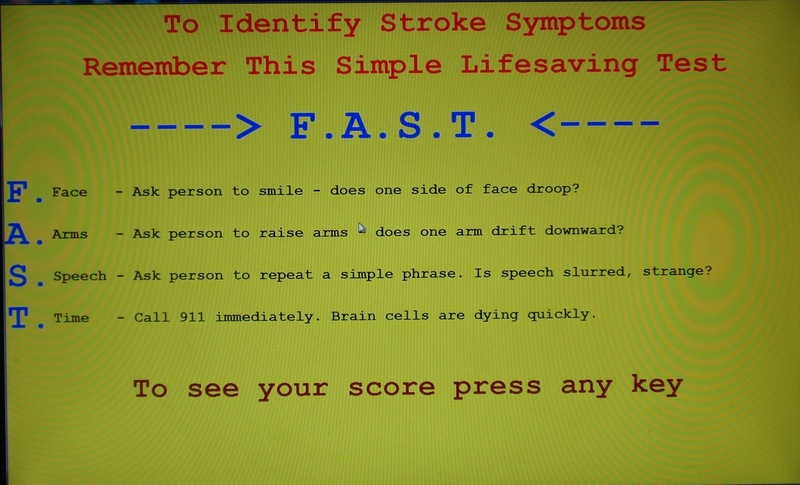 that is an easy way to identify stroke symptoms . While I believe ELSIE and her MegaBrain were the star of the show (ahem...cough, cough) there were many other useful things going on, too. Cindy Chambers was there with books she wrote for children, addressing stroke awareness as well as books on other topics. Cindy is the author of The Beamer Book Series and Tell Me Town. website: (www.tellmetown.com) "Tell Me Town was created to give children and their families a delightful experience with the characters from The Beamer Book Series. Tell Me Town combines fun, learning and support with kindness and respect for all. Tell Me Town is a happy place where children and their families can take a break from the challenges of life and spend time in a place where everyone is thoughtful." As Karen Going explained: "Cindy wrote the Beamer book series and generously donated not only her time but her books with signatures and plush Beamer dogs. Cindy’s books have both primary and secondary stroke prevention teaching and I know that this contribution will save someone’s quality of life." In addition to the MegaBrain and ELSIE promoting stroke awareness, there were medical professionals conducting stroke assessments and consultations. Monique, shown at left, and Agnes, shown below, are conducting stroke risk assessments. Agnes helping a couple of visitors. Stroke response nurses Minette, Elizabeth and Kim promoting stroke awareness. I might be in trouble here, too, because I'm not sure I got Elizabeth and Kim's names right or in the right order. Sally and Barb staffing the "front desk", explaining Inova services and directing visitors to the entrance of the MegaBrain. Another aspect of stroke awareness is cholesterol awareness. Cholesterol levels have an impact on many heart conditions as well as stroke. As part of Inova's event there were medical staff onsite providing cholesterol assessments, screenings and tests as well as awareness. This is Susan and Pat fielding many of the questions visitors had about cholesterol. They sat with them and led them through the risk assessment process prior to having their cholesterol levels tested. And this is Tom. Tom had the critical task of doing the actual cholesterol screening. Whenever I looked in the direction of his table I saw people staged up to get their blood tested after Karen's and Pat's assessments. One more thing I want to point out is the importance of controlling the sodium levels we consume everyday. Sodium has been proven to raise Blood Pressure levels. 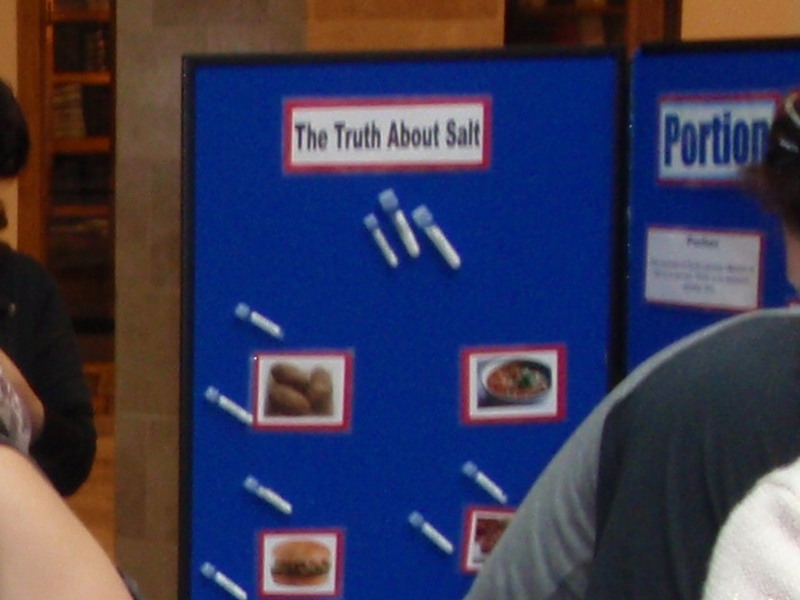 Pamela, standing to the left of this picture, had an eye opening presentation on the amount of sodium we consume everyday without even realizing it. She showed me a glass tube with about 1/4 teaspoon of salt that barely covered the bottom of the tube and explained that it is the equivalent of what the FDA recommends for one day's total sodium intake. She then picked up another tube of the same size that was almost completely filled with salt and explained that it was the amount of sodium found in the average can of soup. She had many more comparisons like that with other foods. Children were not left out of the awareness process, either. They even had a table set aside just for them, to color and learn about F.A.S.T. I'd like to say that this event was one of the most well organized and well run events I've attended. Karen and Joanna did an exemplary job of putting this together and they reached a lot of people with the message and benefits of stroke awareness. I want to give special thanks to Karen's husband, Walter, for taking ownership of the exciting task of using the "clicker" and counting everyone who went through the MegaBrain. I have done this myself in the past so I can empathize with him. There were about 2,000 people who walked through the MegaBrain so his thumb may be rather sore today. I want to add that Walt also talked with every kid walking through the brain, who was active in sports, about sport safety. I also want to especially thank Mike Schmeister, who is the manager of the Neuro-diagnostic Department at Inova Fairfax, and Karen's son Neal Going for helping get that 350 lb beast of a brain back in its box and into the van for the trip back to Peoria where it will be displayed at our Peoria Chief's baseball Strike Out Stroke (tm) event. The Chiefs started in the early 1980's as a minor league affiliate of the Chicago Cubs before joining the St. Louis Cardinals farm system this year. Unfortunately I did not get a picture of Neal, Karen's and Walt's son, but here is Mike and Walt, to the left of the men in black, who I believe are from Fairfax County EMS, and a couple of the Inova Stroke Response nurses on the right. I don't know what kind of jacket that fourth guy from the left is wearing but my flash sure lights it up, doesn't it? I know there are volunteers and others who I did not get a picture of or mention here (and I sure hope I got everyone's names right). I apologize for that, but being left out of my feeble rantings in no way diminishes the work and benefit they provided to make this event a success. I may not know who they are but Karen and Joanna do and I'm sure they will see that they get the thanks they deserve. Thank you all! This is how ELSIE and her MegaBrain exited the mall to the purple loading dock. And this is how ELSIE and her MegaBrain got to Peoria.
. Karen Going without whom this would not have been possible.
. Rob Theis and Barb Mancini of Neuroscience Admin for endorsing the event.
. Joanna Fazio who worked tirelessly on the planning and funding and execution.
. Jalil Bentaleb from Alex and Jean Snyder from Fair Oaks Stroke Coordinators. awareness and for displaying the many posters.
. Lynda Ariaban, RN from Loudoun and Sally Jewert, RN from IFH stroke information greeters.
. Julie O’Brien, NS Admin Memory Center and Neuroscience.
. Zeena Huang from Genentech.
. Agnes Bartek, RN from Interventional Radiology counseling and promoting stroke awareness.
. Dr.Cochran, Dr. Ecklund, Dr. Bicksel and Dr. Tehrani who attended and supported the event.
. Mary Munchak from Fair Oaks Lab front line brain greeter.
. Marina and Jack Support Group members.
. Walter, and son Neal of the Going team.
. Larry Schaer Retreat & Refresh Stroke Camp Associate Director helped with grant money to pay for the event.
. Chuck Jones Volunteer and self appointed Vice President of Temporary Logistics and Computer Services, Retreat & Refresh Stroke Camp. You (or a loved one) have suffered a stroke. . .
You survived immediate Emergency care. . . Your acute care and extensive rehabilitation has ended. . .
You try to reclaim a vital and meaningful lifestyle while enduring the daily restrictions of a stroke . . . AND . . .
You have no continued support! Nearly 250,000 new stroke survivors and caregivers face these challenges every year. NOW . . . IMAGINE . . .
...that you can escape for a three or four day weekend of new friendships and opportunities, while enjoying the benefits of relaxation, continued education, socialization and ongoing support. read or write a good book, take a nap or a quiet stroll in the woods. Have healthy meals, prepared for you onsite. Take part in craft projects; painting, soap making, jewelry. What we have found: Direct support to survivors and caregiver, educational opportunities, better public understanding, renewed hope and motivation, opportunity for survivors to help other survivors, increased community support for survivors, caregivers, and family members. 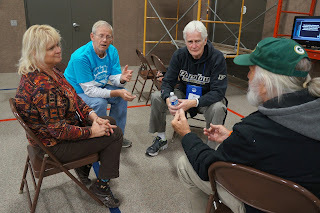 "Little did I know when we signed up how much fun and knowledge I would gain from Stroke Camp. 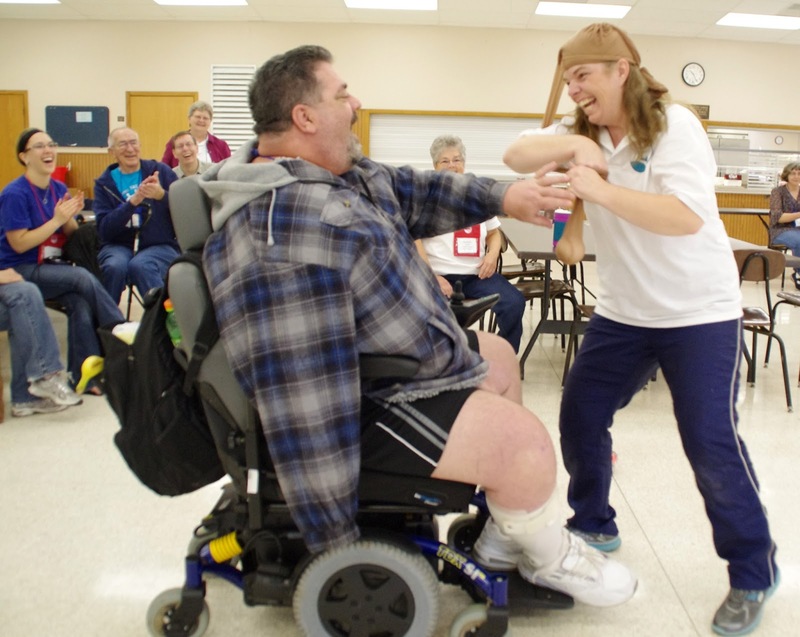 Stroke Camp is very important because it allows survivors and therapists an opportunity to share knowledge and interact socially outside of the hospital setting. It was especially meaningful as a celebration and honor to all caregivers as they were able to get pampered with manicures, facials, and massages, while enjoying a weekend socializing with other caregivers, sharing stories, and merriment the whole time. We danced, we sang, we beat on drums and played instruments, enjoyed spectacular food and service. We fished, boating was made available, and we cruised around on golf carts. All in all, at the end of the day, we needed Stroke Camp more than it needed us." "It was well organized and offered such a variety of activities! For me as a caregiver, it was a great release and welcome relief from our normal routine. Everyone helping, made us feel so comfortable and were there just when we needed them." "I've been volunteering at camps since 2004. We have a great majority of repeat campers every year, so that should tell you something right there. We have from twenty up to sixty campers and volunteers attending our three day camps throughout the United States. It is heart warming to see our stroke survivors laughing and enjoying themselves and feeling almost normal again. It does wonders for them to meet and share their experiences and see how other survivors are progressing and improving, giving each more hope for their own future. It is also a great way for the caregivers to meet and compare notes, share ideas and experiences, and gain encouragement. Both the survivors and the caregivers realize they are not alone on their journey to recovery." I thought I'd do an article about blogging this week. I guess that's what happens when you try to do a new blog article every week. There are those times when you scratch your head and wonder what to do next and then grab the first thought that comes into your head. So, what is a blog? Well, at least you know how to get to one or you wouldn't be reading this. A blog is a web log, shortened to the word blog, if the word blog could be considered a word, which we will do in this article because "Who am I to blow against the wind?" A blog is a place to present ideas, stories, topics, information, stuff like that. You will find blogs on the internet covering many topics. You name it and there is probably a blog about it. This blog, sponsored by Retreat & Refresh Stroke Camp (RRSC), is about stroke related information, and events provided by the camp. The idea is that the reader gains some knowledge or entertainment, at least, and has the opportunity to respond with their own thoughts, information, experiences and knowledge about strokes or anything else that happens to strike their fancy at the time. We are open to pretty much any topic. Responses aren't totally necessary for a blog to succeed but they certainly are welcome and sometimes they spark ideas for future articles. Wikipedia includes this in their definition of a blog: "Many blogs provide commentary on a particular subject; others function as more personal online diaries; others function more as online brand advertising of a particular individual or company. A typical blog combines text, images, and links to other blogs, Web pages, and other media related to its topic. The ability of readers to leave comments in an interactive format is an important contribution to the popularity of many blogs. Most blogs are primarily textual, although some focus on art (art blogs), photographs (photoblogs), videos (video blogs or "vlogs"), music (MP3 blogs), and audio (podcasts). Microblogging is another type of blogging, featuring very short posts. In education, blogs can be used as instructional resources. These blogs are referred to as edublogs." Our blog has used all of those types of media. Also, using the above definition, I guess our blog is an edublog sometimes, too. This blog you are reading now is published using a blog template provided by a product offered, free of charge, by an internet company called Blogger. They have several templates available and I chose the one you're using now as one that fits our needs. If you've ever had the desire to start your own blog, this product is relatively easy to use. Their web address is www.blogger.com. I say relatively easy because there is a learning curve determined by your experience dealing with computers and writing in general. However, Blogger has an excellent place to get help from their support staff and a forum where bloggers like us can go to help each other with questions and problems. Like most things in life, the more you use something the better you get. Since December of 2010 there have been about 76 articles posted on this blog site. Many of them have come from camp volunteers, medical staff from the hospitals that sponsor us, and many have come from the stroke survivors themselves, but most have come from the staff of RRSC. Each article is called a page in blogger speak. The Blogger product keeps track of the number of times a page is viewed and, at the time of this writing, our blog site has had almost 10,000 page views since startup. You might ask who these viewers are. I'd like to know, too, because I'd like to thank them for visiting. I can't tell specifically who they are, but what is available is their country of origin, browser type, how many times an article is viewed, and generally what web address the viewer typed in to get to this blog. I'd say that 70% of the page views come through the blog address itself, rrscb.blogspot.com, and the RRSC Facebook page. Another 20% come through the camp web site, www.strokecamp.org. The rest have come from Google searches and a few have come from spammers or autobots that scan for sites to spam. Yes, we've been spammed many times and that is the reason we have to use that clunky word verification thing for replies from you. I know it discourages many of you from replying, and I don't blame you. I keep hoping Blogger will come up with something better, more friendly for you. You may not have seen any of the spams because the blog product itself does a good job of filtering out a lot of them, and the rest, the ones that do get through the filter, I delete myself when I get automatic email notifications. The spammers leave a message that is supposed to make you think they read your article and liked it and then ask you to visit theirs. They're wording is so phony it's obvious that they are not real replies and they always include a link to a product they're trying to sell. My favorite spam is one about buying toe rings. Now, if any of you readers are the one who sent that, I apologize and will give you another chance to sell me that toe ring. I am convinced 95% of these are legitimate readers. I believe we are reaching a lot of people in need of stroke information and reassurance in other countries. I don't know what compatible means. Maybe it's a supercomputer in the Pentagon. As you can see we are being reached by every technology available today. I hope you found this informative or at least entertaining. If you have any questions or have something you'd like to contribute, you know where to find me. As I mentioned in last week’s blog article, I had the privilege of attending a Native American Christian Church located in East Peoria, Illinois, and had the pleasure of meeting their pastor, Pastor Gary Billiot. Pastor Billiot is Native American. The church is The Native American Fellowship Dayspring United Methodist Church, 201 North Norwood Place, East Peoria, Illinois 61611. If you’ve ever been to the EastSide Centre in East Peoria, Illinois to use their fitness center or attend a school baseball or basketball game or go swimming at the Splashdown Water Park you have probably seen the large log cabin building that is the church up on the hill. If you ever want to attend a unique, spiritually uplifting church service, I urge you to attend there on any given Sunday. Their church services start at 1:15pm so try to be there by 1:00. The church service is basically a Methodist church format similar to most Protestant churches. The congregation is mixed Native American and non-Native American. The atmosphere and dress code is relaxed, non-formal. The congregation is seated in a double row circle around a large ceremonial drum instead of in rows of parallel pews. During the church service five Singers sit around the ceremonial drum, with other church officers sitting behind them. The Call To Worship begins with a prayer led by Pastor Billiot, followed by the awakening of the drum, scripture readings, from the bible, by a congregation member, and the sermon by the Pastor. There is even a children's "sermon" led by a lay person reading a Native American story. A couple times throughout the service the ceremonial drum is used to offer prayers to God, the Holy Spirit, and our Savior Jesus Christ, to give thanks, to request healing and to provide guidance in our lives. I cannot explain the effect the drum ceremony had on me personally. Suffice it to say it is an uplifting experience. The bulletin I was handed the day I attended Dayspring contained an insert with following description, written by Pastor Billiot, of what the drum ceremony meant to the Native American culture, how it enriches their lives, and still has meaning to them and to Dayspring today. We as Native American Indians have a rich culture and because of this Indian drums are probably the most familiar instruments among the Native Tribes and non-Native people alike. From the beginning the Drums have always been at the center of a lifestyle for Native Tribes. This type of relationship and respect forms a meaningful foundation of our religious views, Native American spirituality as well as social gatherings where the drum is represented as the heart of all Native American events. The Native Indian drum has become an essential way of expressing Native American spirituality. Not just music, art or dance but also it is a method of praise to the Creator and honoring Mother Earth who provides the space for dancing, or for gathering for religious purposes. Embellishing the drum becomes a very spiritual and personal task to the owner. The ones who sit around the drum become communicators who express their inner most spiritual feelings and beliefs in the Creator. They honor and respect the drum not because it holds great significant powers but honor it for what it represents. The drum is, “the bringing together the spirits” of everyone who has touched the drum in a good and positive way. It is honoring the one who have touched the drum and has gone on to the spirit world; the ones who have bled and dripped their sweat on the raw-hide or wood while putting the drum together to bring out that perfect sound. This sound will inspire the listeners and bring them to a special place of spiritual power and energy. In some tribal cultures the Singers (sometimes known as drummers) will place something of personal value inside the drum to permanently join himself with the drum. This has always been a spiritual aspect of life pertaining to Indian beliefs and the Indian drum. In our history we have always used drums in various ways to connect with a higher power known to most as Kitche Manitou, “The Great Spirit”. To the Native people, the drum is much more than just a decoration or a remarkable musical instrument. The drum is believed to speak to the Singer in a positive spiritual way and in turn, this is transferred to the listeners. The circler patterns of the Native drum represent the earth and life cycle and when the drum is awakened it awakens a new spirit in us ready to receive whatever the Great Spirit has for us. The most well-known drums are Indian hand drums used in many personal healing and religious ceremonies as well as public ceremonial Gatherings. When Native Americans begin to see the drum as a living entity and when the songs and dances are being done by beats of the drum, they begin to find a closer spiritual relationship with the Creator, the mysterious powers of the Great Spirit. These Native American drums are recognized as a living entity, this indicates a strong connection with the Creator. To many Native American tribes the Native drum contains thunder and lightning, and when it is awakened it helps to get the Great Spirits’ attention and it also helps contact the spirits of the Native American ancestors. With all this in mind when you build a drum, a selected person who is referred to as the drum keeper, will be chosen to watch over the sacred drum. In Native Indian culture this is a highly regarded honor to be the keeper of the sacred drum and in some Indian Tribal culture and custom the drum keeper is usually the oldest son of a selected family. Because we look at the drum as a living and breathing entity; we believe that the spirits of the tree and animal that the drum was made from live within the drum. We also believe that the beats of the drum help call out to these spirits and the spirit of our ancestors to protect and watch over us. However, it is not just that of the wood and animal skin, it is the power of our Creator that dwells within all living things that brings all this together, (otherwise all we would have to do is go and touch the logs that are sitting on the ground or touch a cow). Many of the Native American drums differed in sizes among diverse tribes. Also, the drums were completely different and made different according to Native Indian traditions. However, most all of the ancient Native American drums were made from wood with animal skin heads. In addition, depending on where the tribes lived some Native American drums were made from deer skins and others were made from buffalo skins or other type of skin found in the area. These drums were extremely important and sacred to the Native American tribes, and there were many sacred ceremonial guidelines surrounding a drum. Many Native Americans also had other percussion instruments such as hand rattles, which is similar to the drums in the standpoint of honoring the Great Spirit. The drums had many other uses to the Native people and some included healing ceremonies, war preparation dances, good hunting, and even festivals to honor the Creator to help bring a good harvest. There are many handmade Native drums that can be found nationwide on many Native American Indian reservations and at many of these places you can see sequence of events from some of the tribal ceremonies. The beating of the drum is compared to the beating of the human heart and is said to represent the heart beat of Mother Earth, “which is a belief of most traditional Native American”. As a result, the drum in this respect, become the vehicle which connect one's spirit with that of Mother Earth and the Great Spirit throughout the history of Native Americans.